Now, see to my eyes (or on my computer!) it's the second pic where the water shows up as blue! I love "curves" too, and use it on Picnik a lot. 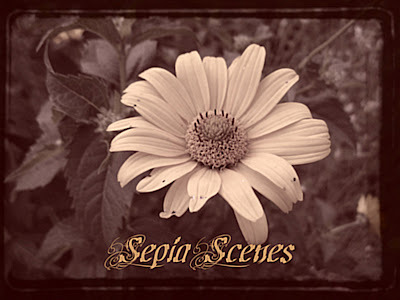 I have a sepia cemetery pic up at It's A Blog Eat Blog World and over at Purrchance To Dream I played on Picnik with one of my favorite Daphne pictures ever to make a great sepia-ized portrait, AND it's the un-veiling of my new Sepia Scenes badge for Purrchance To Dream, too! Let me know what you think! Yeah, Blogger's been having issues with scheduled posting off and on for the last several days. This happened a few months ago too. I thought they'd resolved it, but apparently this time it's more intermittent than it was before. Can't quite make out what that is floating in the surf, but the composition is pretty cool! That sky blue is so subtle, it adds any a slight bit of color to the nearly monochrome. It is an inviting sky blue that makes the day so much more inviting. Great effects! That is really neat. I really like the top one. Something new to play with! Thanks Mary. It should be said more often; but THANK YOU for all you do in all the memes!!!! Sorry, my first link is to the wrong blog. Can you delete the first one for me. I really like the first picture. Great job! 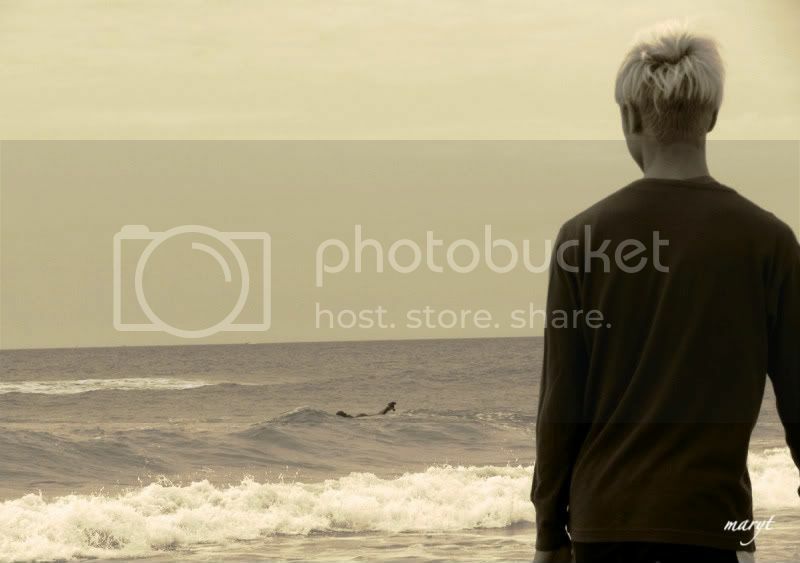 I like what you did with this ocean photo. I also prefer the first one. Both images are intriguing, but the first one is especially lovely! It has a very romantic atmosphere! I could see the toning...and I sort of think the photo was perfect for it. I meant to get something ready to join, and forgot. With babysitting Lorelei, I don't get much time for thinking. I do love it and thanks for the link, I'd like to try some new things. I can see the blue very well. What a beautiful idea and lovely shot! I haven't explored Curves that much. I'm going to have to get more into that. I really love the photo you have edited. I have a Photshop Elements that is about 100 years old and I have never truly got the hang of it! I need to upgrade. Maybe when I get a new computer...my computer is 100 years old too and the audio went out last week...the hell I have to live in (lol).. I do nearly the same thing just using the colorization option in PSP. Mine, today, is an ominously cloudy sky in half sepia. I have been playing around with curves more and more. Getting better at it. I didn't use it this shot but have in some past ones. Love your shots. Your blog is beautiful. I love sepia and you do amazing things with it on Photoshop. I had a trial run and need to purchase it. 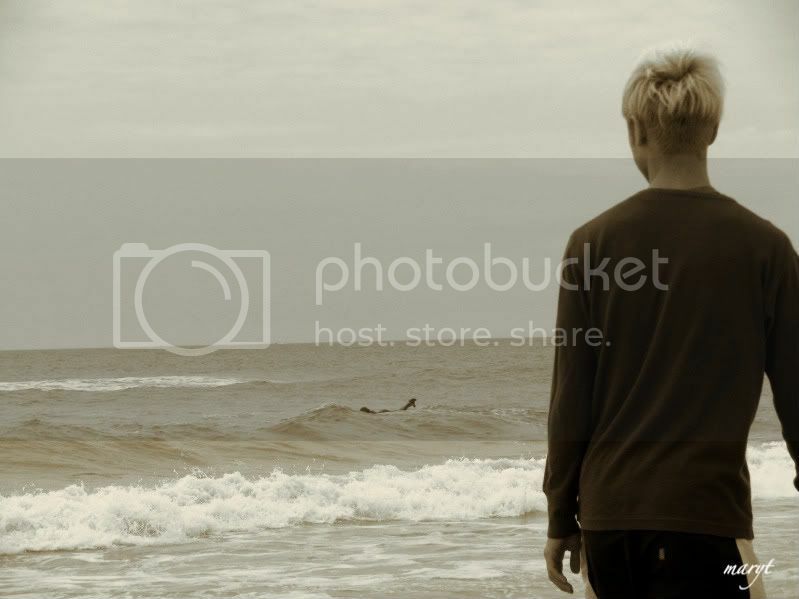 This photo of the boy and the ocean is marvelous. I prefer the first shades.